Meet the FBI’s Ingrid Skyberg, the toughest Special Agent ever to come out of Quantico. Assigned to the US embassy in London, Ingrid is on the case when an American citizen gets into trouble… or winds up dead… or is accused of a crime they didn’t commit. Resourceful, tenacious and indestructible, Ingrid Skyberg is utterly unputdownable and can take whatever her adversaries throw at her. The series also stars some familiar faces from Eva’s earlier books The Loyal Servant and The Deadly Silence (formerly The Third Estate). In Europe to help broker a peace deal between warring African nations, Secretary of State Jayne Whitticker is in the middle of delicate negotiations when her favourite grandchild disappears from Paris. 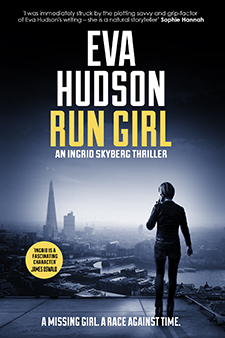 Special Agent Ingrid Skyberg is hauled out of her FBI training session at Scotland Yard to head the hunt for the 18-year-old girl, who the FBI believe is now in London. Read the full description and find out where to purchase it here. An American psychology student is arrested following the violent death of her former roommate. But the vulnerable student is not alone – she has Special Agent Ingrid Skyberg in her corner. And Ingrid will do whatever it takes to protect her charge and deliver justice. A young American trader is found fatally poisoned in his office in the City of London. Two days later, a Latvian immigrant is discovered floating face down in the River Thames, brutally murdered. 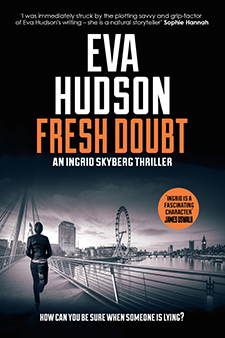 When Special Agent Ingrid Skyberg, the FBI’s criminal investigator in London, starts to dig, she puts her own safety at greater risk than she ever has before. The problem is, she doesn’t even know just how much danger she’s in. Read the full description and find out where to purchase the book here. In a seedy hotel room in central London, the baby daughter of a US Air Force pilot lies lifeless in his wife’s arms. Accused of killing the 14 month old in an unconrolled rage, Kyle Foster flees, taking his 8-year-old son with him. Following orders from The Pentagon and the American embassy, FBI agent Ingrid Skyberg and a Special Forces cop must hunt Foster down, by any means necessary. A teenage girl disappears after witnessing a gangland murder in Chicago. Nine months later and heavily pregnant she arrives in London… only to disappear again. Special Agent Ingrid Skyberg has just two days to find the girl and get her to testify or else a brutal killer walks free. But Ingrid isn’t the only person looking for her, and a war that started on the streets of Chicago is about to explode in the peaceful English countryside. Stockholm is under siege. A bomb has gone off, a series of high profile people have been kidnapped, and the city is on lockdown. 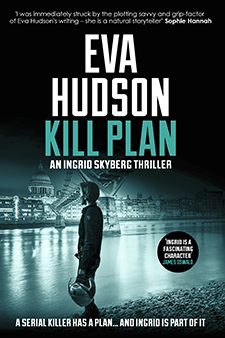 Unfortunately for Special Agent Ingrid Skyberg, everything is kicking off on the same day she is in town to complete a dangerous assignment. Her undercover mission is so secret, and so illegal, that neither the FBI nor the US government can ever know about it. Her instructions are simple: no ID, no credit cards, no trace. If she ends up in jail, or floating face down in the harbor, there can be no way of identifying her. Each novel features Angela Tate, a ruthless reporter, fearlessly investigating injustices and misdeeds. Standing up for the ordinary, ignored and abused. The Loyal Servant features an ordinary civil servant and mother of three caught up in a tangle of political intrigue and corruption. All she wanted to do was to keep her head down, work hard and try to avoid being laid-off, but after discovering the Minister for Schools dead at his desk, things get complicated. Losing her job quickly becomes the least of her worries as she uncovers a political scandal that could rock the country. Read more about it and find out where to download it here. The Deadly Silence (formerly The Third Estate) is set on a notorious south London council estate. A child goes missing one bitterly cold February afternoon and the police converge on the estate and surrounding area, pulling in extra manpower from the neighbouring boroughs. When little Casey is not found within the first crucial 48 hours, the media start to probe into the private life of her mother, painting her as feckless and irresponsible. It’s not long before the police have doubts about her too. Only one reporter, investigative journalist Angela Tate, continues to believe Casey’s mother has nothing to do with the disappearance. Angela covered two similar missing girl cases over 30 years ago and while the police continue to search for Casey, Angela sets out to solve a three-decade-old mystery, uncovering more than she bargained for. Grandmother Jean Henderson is visiting the US from England to help her son with his new baby. But just moments after the taxi drops her in downtown Manhattan, she witnesses the brutal execution of a grocery store clerk. Shaken by the ordeal, she arrives at her son’s apartment to find he and his heavily pregnant wife have vanished, owing a fortune to a violent loan shark. Read the full description and find out where to purchase here. Hollywood 1939. Promising starlet, Clara Lockhart, disappears from a glittering party in Beverly Hills the night before her first big audition. Worried Clara’s disappearance may prove permanent if she doesn’t act fast, her roommate hires L.A.’s best private eye to save her. Spencer McCoy knows time is against him, but soon discovers he’s made a powerful enemy in Howard Strickling, MGM’s notorious publicity boss. With escaped big cats stalking the streets of L.A., heavies threatening him at every turn, and an ambitious new secretary desperate to do some sleuthing of her own, McCoy must battle the might of the movie industry if he’s to uncover what really happened to Clara. But time has almost run out: if McCoy doesn’t rescue her soon, she’ll become another casualty of the pitiless Hollywood machine. Featuring real 1930s stars of the silver screen, The Hollywood Detective will transport you to the magical Golden Age of movie-making and keep you turning the pages until the very last twist. Fading movie star Elisabeth Clay had been hoping to adopt a baby from a Los Angeles orphanage. But when she returns to Hollywood after filming on location, she discovers her beautiful baby girl has disappeared. Elisabeth turns to the city’s finest detective agency—Spencer McCoy and Associates—for help. There’s just one problem: Spencer McCoy is in jail and the associate in question has only been in the detective business for a little over a week. Can feisty Rose Randall beat the odds and find Elisabeth’s baby? Can she also figure out a way to get her boss out of jail? One thing’s for sure, she’s certainly going to give it everything she’s got. Join Rose as she blisters through 1930s Tinseltown in a light-hearted caper that features plenty of glamor, heaps of adventure and more than a hint of romance.